This is a standard DIY kit for building a PCB at home, suitable for building a completely functional high quality PCB suited for all kinds of workshops, tutorial, student clubs and entrepreneurs aiming at designing new Prototype circuits. In fact the best in class for entry level circuitdevelopment design and deployment. A must have product for delivering workshops and trainings on PCB design and electronics circuit design. 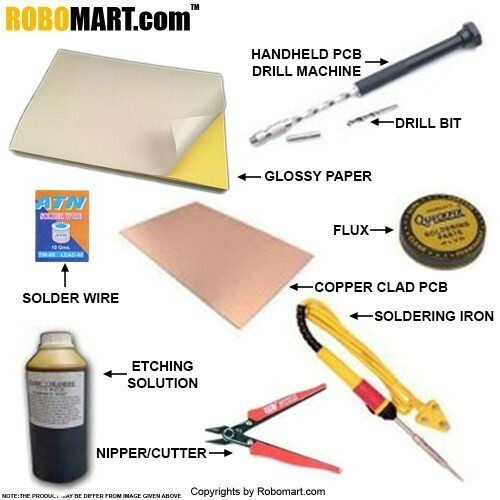 Features of PCB Starter Kit For All Workshop Companies/College Clubs/Entrepreneurs. Requires a Printer for printing on toner transfer paper. Includes everything for developing a standard PCB. Best for delivering workshops and training on PCB designing. Applications of PCB Starter Kit For All Workshop Companies/College Clubs/Entrepreneurs. Also Searched as :PCB Design kit india, developing kit in india,Online buy PCB design kit.